"Power Blade, known in Japan as Power Blazer (パワーブレザー), is an action platform video game developed by Natsume and published by Taito for the Nintendo Entertainment System. It was released in North America in March 1991 and in Europe on January 23, 1992 (1992-01-23). The game spawned a sequel, Power Blade 2, released in 1992. Power Blade takes place in the colony of New Earth in the year 2191 and follows NOVA, the Chief Security Officer of a supercomputer called the Master Computer. He must restore the Master Computer which has been taken offline by aliens by retrieving data tapes located in six sectors. The game features gameplay similar to the Mega Man series, in which players can select any of the six levels to play. Armed with a boomerang, players must complete all six levels, overcoming obstacles and defeating any enemies in the way. 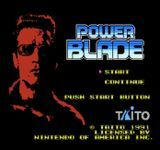 Power Blade is a reworked and localized version of the Japanese Family Computer game Power Blazer, which was released also by Taito on April 20, 1990 (1990-04-20). The original title for North America was Power Mission, after reworking the game they went with the name Power Blade. The reworking included a complete overhaul of the levels, a change of the look of the main character from a cartoon like robot to an Arnold Schwarzenegger look alike, and a significant improvement in gameplay controls. The game's name comes from an item found in several levels; The Power Suit is an item that looks like a helmet. When collected Nova automatically equips the metal suit. This allows the player to shoot energy blasts known as "Power Blades" in any of the 8 directions and through most surfaces." Source: Wikipedia, "Power_Blade," available under the CC-BY-SA License.